It was around September -14 when our little gaming group decided to put together a Flames of War campaign set in Italy -44. As a huge Pink Floyd fan I was immediately inspired by their song “When the Tigers broke free” and decided to paint up a Tiger company. With the new hardcover books for Italy the Schwere Panzerkompanie is if not ideal but at least playable. I also figured that anything painted for this army could later be used in a Hermann Göring-company I have been fiddling with. Naturally, I began the process by painting Tigers. I decided to build six of them together but paint them individually. I was going to use a very limited pallette with these behemoths, so I figured the individual approach wouldn’t cause too many problems with army cohesion. Also, the “production line”-approach is a bit dull and laborous way of spending one’s free time, so I was going to go easy on myself this time. First I painted up my 2iC, who as a grizzled veteran would be tigering around in an old and worn-out hull. Instead of a zimmerit Tiger I used an earlier model for this. I rather like the exaggerated modulation on this tank. Then it was time to paint up the Company Commander’s Tiger. I have been struggling a little bit with zimmerit in 1/100 scale. No matter what techniques I use for it, it always ends up looking messy, too dark and somewhat unsightly. 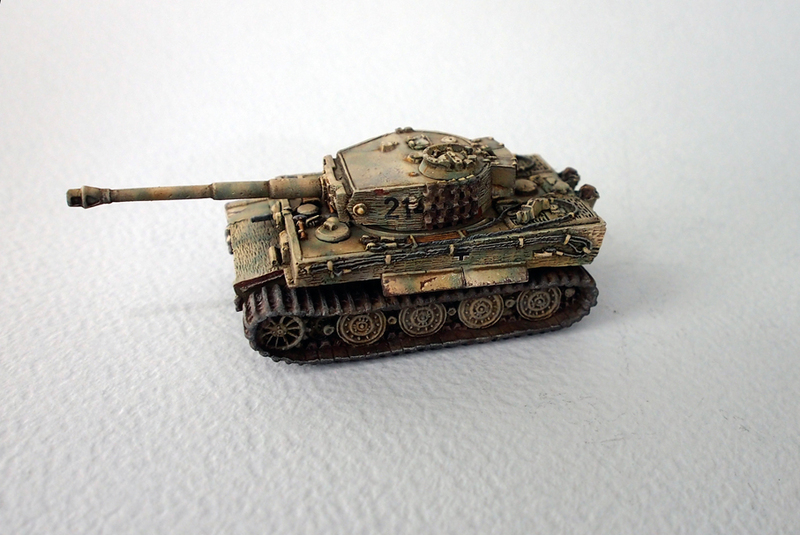 For my CiC in a zimmerit covered Tiger I decided to skip camo altogether and paint the hull plain Dunkelgelb trying to get the modulation work as well as I could. Also, I tried to emphasize the modulation effects with oils at the last stages of painting. After the Old Man I decided to experiment with camo a little bit, limiting to my camo colors to green only. As this has always been the step where it all falls apart, I tried to go real easy with the camo and tried to make the patterns as subtle and muted as possible. As one cannot really use masks for soft edge camo in this scale, it is very difficult to get depth and life to the camo patterns, especially when painted over zimmerit. Instead, it usually just messes things up. I think this one came out alright, though. At the moment I have four Tigers ready with another two waiting for the last steps. I haven’t yet done any powder weathering, dusting or such on these, as I want to wait until I have most of the vehicles ready. Visual cohesion, you know. The 2iC stands out because of the striking modulation and light effects. Monochrome and no zimmerit makes for a nice combo. Also, I wanted to paint some infantry to go with the army. So far I have had time to put together a couple of test/demo infantry stands. As I have mainly been painting winter armies over the last few years, I wanted to try out some summer/warm colours and techniques I might later want to use with the upcoming infantry. Also, I wanted to create a general “look and feel” for the infantry for me to aim for with the painting. First I painted a Pionier stand with quite a lot of stuff and features. I used miniatures from several blisters and boxes and painted them in Hermann Göring -style. The Luftwaffe blue might be a historical inaccuray, but it looks damn good contrasting with the yellowish sand, so I went for it anyway. My aim was to do something totally opposite from the bleak and grim stuff I usually paint, so I went for a rich and joyous pallette of various bright colours. I crafted quite a few details on this stand. Here’s a closer look on them. I also painted up a hero, Oberst Gosewisch. While I’m not a huge fan of German artillery in Flames of War, Gosewisch is an interesting character modelling-wise as he operates on a Large base. Therefore, there’s lots of space to work with. I intended to enter this piece in the Iron Cross painting competition -14, but to my dismay the competition was not held that year. Anyway, it still is a good practice piece. For the sake of variation I included two SS Panzer officers on this scene. And again a few closer looks on the details. This army is still very much unfinished. I’ll be working on it at a leisurely pace and I’ll post any new additions here as they are finished. The first step will be finishing up two more Tigers and a platoon of infantry. Then maybe some StuH42’s and more infantry. We shall see.